William Armes described Penns Mill as it was in the 1850s “It was of three stories, with the heavy production on the ground floor, needle, fish hook and music wire was drawn on the middle floor, and fine wire above”. The waterwheel was the only source of power, there was a boiler producing steam used in the manufacturing process, and several furnaces for heating the metal. The wire factory had a floor area of 8,245 square feet, and there were other buildings - smith’s workshops, a cleaning house and a counting house. In the 1850s over 100 workers were employed at the mill, not counting casual labourers, most of them living in the Parish of Walmley. Walmley was a large parish with many farms; the 1851 census lists 140 households there, mostly headed by farmers and farm workers, but the heads of 40 of the households were “wire-drawers” from Penns Mill. Mill workers also came from other parts of Sutton or from Erdington. The more senior workers lived close to Penns in houses built for them by Joseph Webster III, who owned the mill and surrounding land. Most of these houses and cottages were on a plot of land near the railway bridge (some were demolished to make way for the railway), one four-family house and five cottages, occupied by Joseph Armes, John Arnold, William Dunn, John Jones, William Knowles, Joseph Martin senior and junior, William Orton, Amdrose Smith , and William Wells. Three other cottages were on a plot of land near Fourlands Avenue, and housed Joseph Brandon (William Armes called him Pug Brandon, and noted that he was dumb, a stoker of the Penns annealing furnaces, and verger at Walmley Church), Richard Taylor, and Charles Dunn. These three cottages were probably in poor condition, as they were demolished in 1860. In the 1850s William Armes was a boy living with his family at Langley; his father’s occupation was given as “wire-drawer”, indicating that he worked at Penns, He may have been engaged there in other work such as cleaning the finished product or operating the furnaces on a weekly wage of £1.25; but if he was a skilled wire-drawer on piece work he could earn as much as £3 a week at busy times. William was twelve years old in 1859 when he claimed to have shut down the waterwheel at Penns Mill for the last time on November 21st. The owners had decided to concentrate all their works at Hay Mills, east of Birmingham. When Webster and Horsfall’s factory at Penns closed much of the machinery and equipment was taken to Hay Mills, and the mill buildings were knocked down. Most of the workers also upped sticks and moved to the Small Heath area, and Penns became a tranquil country house after centuries of noise and industry. At the time the population of Sutton was growing and the village of Walmley was becoming established, but the loss of Penns Mill with the exodus of its workers had its effect on the population figures - 4574 in 1851, 4662 in 1861 for Sutton as a whole, while for Walmley Parish the population fell from 740 to 600 over the same period. 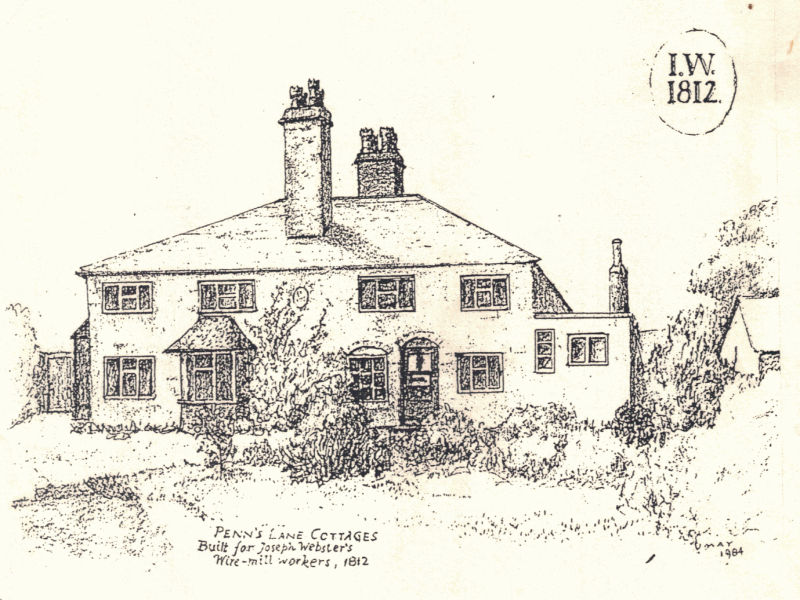 Penns Lane Cottages, sketched by the late Jim May in 1984, stood next to the railway bridge in Penns Lane, the site now occupied by Arbor Court.